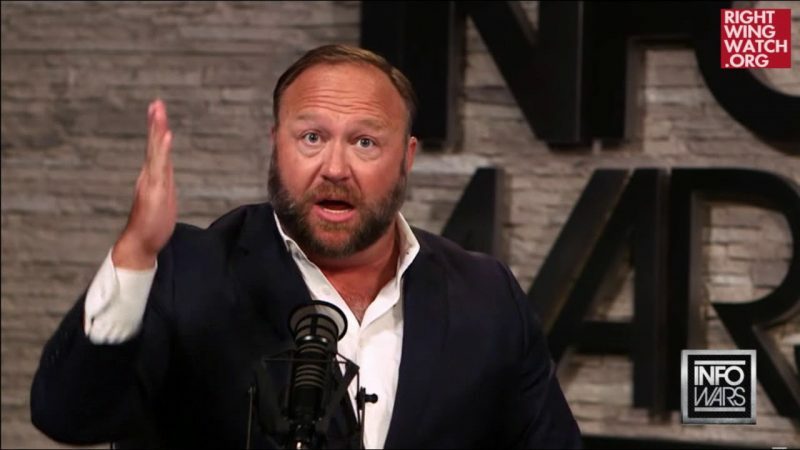 From the outset, yesterday’s House Judiciary Committee hearing on the practices of Google was destined to be a bit of a circus, what with Infowars host Alex Jones holding court in a hallway outside the hearing room, railing against the tech giant, which removed his web-based programs from its YouTube platform, for violating Google’s own terms of service which forbid hate speech and harassment. Roger Stone, the self-described “dirty trickster” and Trump adviser who appears to be a target of the Mueller probe, stood nearby. Then there was the guy sitting behind Google CEO Sundar Pichai dressed as the Monopoly Man of Parker Brothers fame, complete with top hat, monocle and exuberant mustache. Watching the proceedings, however, you’d be forgiven for thinking it was a show led by ornery old men who hadn’t quite figured out how the intertubes work. The hearing was spurred by complaints from Republicans who claim that “conservative voices” are muted by Google in its searches, which they claim favor “liberal” media. What they don’t tell you is that counted among their idea of “liberal media” are virtually all mainstream news outlets—the places where most Americans get their news. President Trump, for example, claims that only negative stories about him appear in the top range of Google search results. It couldn’t be that Trump is doing things that have objective measures, such as telling lies, that mainstream media are compelled to report, or that CNN.com has a bigger following than Breitbart. The Daily Beast’s Will Sommer tweeted that a study cited to make that point by Rep. Lamar Smith, R-Texas, appeared to be based on less-than-scientific standards. Or it couldn’t be that an algorithm has picked up an abundance of pairings of the word “idiot” with images of Trump—to the point at which Trump’s image fills the page if you search the word “idiot” and then click on “images”. (Go ahead, try it—and thanks, Rep. Zoe Lofgren for the tip!) No, it must be that the nefarious communist coders at Google have it in for Trump. Among elected officials, House Majority Leader Kevin McCarthy, R-Calif., has taken up the right-wing cause of a war on “shadow-banning” and other supposed Silicon Valley suppression of right-wing content. In fact, back in August, McCarthy accused Twitter of shadow-banning a Laura Ingraham tweet because it showed up in his feed with its content obscured by text saying “This Tweet is not available because it includes potentially sensitive content.” This prompted a torrent of responses pointing out that McCarthy received that message in lieu of Ingraham’s tweet content because of McCarthy’s own personal settings on his Twitter account. Not that he’d let that keep him out of the shadow-banning wars. From time to time, important questions about Google’s development of a censorship-friendly product for the Chinese market or Google’s use of consumer data poked through (Pichai seemed evasive), but the font of right-wing resentment over poor showings in the search engine and social media universe dominated. “It’s a yes-or-no question!” Poe shouted. Gohmert is now speaking at the Google hearing. He is upset YouTube reportedly partners with the SPLC as for its “trusted flagger” program. 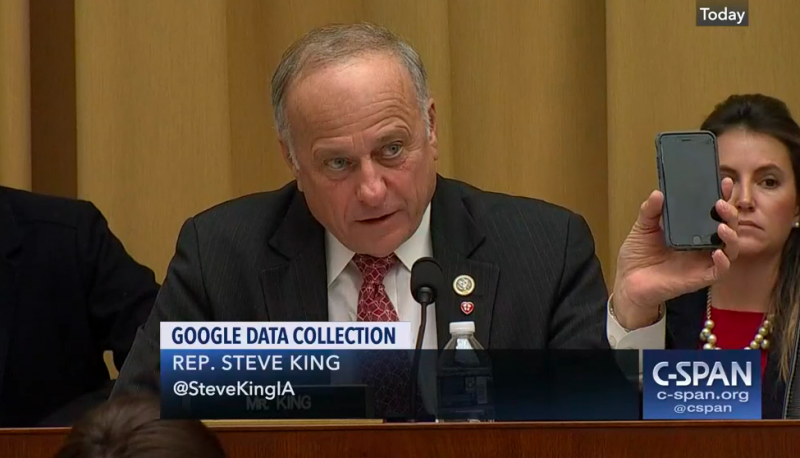 Rep. Steve King, the white nationalist Republican congressman from Iowa, demanded from Pichai the names of Google employees who write the algorithms that King contends demonstrate a bias against “conservatives” in internet searches, so that Congress could inspect the coders’ own social media accounts, presumably to determine whether or not they are liberals. King also demanded that Pichai tell him how King’s 7-year-old granddaughter wound up seeing a photograph of her grandfather, accompanied by inappropriate language, pop up on her iPhone during the midterm campaign. “Congressman, the iPhone is made by a different company…,” Pichai replied.